The Airstream Classic now comes with Smart Control Technology. What does that mean? Well, it means you control of all the main features of your Classic in the palm of your hand! Just download the app and sync it with your trailer and voila! You’re all set to control everything remotely with your cell phone! How convenient would it be to have your trailer nice and cool when you return from a beautiful hike, sweating profusely no doubt because it was also very hot? Sounds like you need a trusting neighbor to do you a favor! OR you can just open the app on your phone and set the thermostat to your desired temperature and when you return to your trailer, you can enjoy and relax instantly in your already cooled off Classic. Maybe an unexpected storm rolls in while you’re away from your campsite and you remember your awning is out – that’s not good. There’s no need to worry about costly awning repairs with this handy app you have on your phone! You can control your awning from wherever you happen to be. Shew! There are so many great things about this new Smart Control Technology that you will wonder how we ever survived without it! You can control your lights, awning, and thermostat and you can check your tank and battery levels. While you’re out grabbing groceries, you can check your propane and rather than finding out as you are ready to fire up the grill that you are out, you can grab some while you are picking up your fixins! 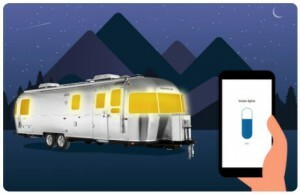 This technology keeps you connected to not only your Classic but also Airstream and to your friends and family. The app provides dedicated 4G LTE data, so you can connect just about anywhere you happen to be. You can directly dial Airstream Customer Service, access your owner’s manual, and FAQ’s. You can also locate your Airstream Classic if you happen to wander off the trail, get lost, or simply forget where your trailer is! Airstream always is moving forward and has a lot of exciting things happening in 2019! Enjoy this fun and innovative advancement in the Airstream Classic travel trailer while you are waiting for the next amazing thing Airstream releases!